1. Get a coconut and a cleaver or machete. 2. 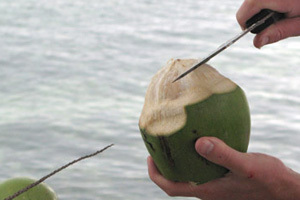 Hold the coconut by the stem side and at a 45 degree angle, chop into the top of the coconut (photo at right below). With the blade in the coconut, push to peel the outer green layer. (left photo). (Our fresh coconuts only need to have a little bit peeled). 3. What is under the skin is much more tender. Still at a 45 degree angle, use the knife to slice away the rest of the white flesh to peel it away from the hard nut. 4. Flip the coconut to trim the stem-side to make it flat so it stands up. About 1 inch from the end chop in at a 90 degree angle. Peel away the green skin…then shave away the white part to make a flat bottom. 5. Hold the bottom. At a 45 degree angle, chop into the top of the hard sphere near the top. Chop lightly…it will cause a round chunk of the top piece to pop off. 6. Drink with a straw or straight out of the nut. 7. If you want to eat the meat, chop the nut in half after you are done drinking and spoon out the meat. 1. Trunks with a thin base: these have a thin layer of tender meat inside and are good for drinking and scraping out the meat. 2. Trunks with a fat base: these have a thick hard layer of coconut meat and are good for cooking. This type of meat is also what coconut milk and coconut oil are made from. Justin! Is this a Panamanian coconut? I have to say, I didn’t know about the 2 types of coconut. I thought it was the diference between new/young and aged coconut. Good to know. This was in Belize, Anamaris. I had thought the same thing … but there are actually two species of coconuts (probably more). I’m in Floriday today so this will come in handy. Wonder if my hotel provide me with a machete…!